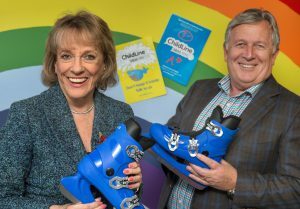 Dame Esther Rantzen, the well-known journalist, TV presenter and Childline founder has launched this year’s charity partnership between the NSPCC Cymru / Wales and Cardiff’s Winter Wonderland, the city’s principal festive attraction (cardiffswinterwonderland.com). Now President of Childline, the invaluable service addressing mental health issues in young people, Dame Esther is best known for presenting the hit BBC television series That’s Life! for 21 years up to 1994. In 2012 she set up The Silver Line, designed to combat loneliness. After record numbers of skaters took to the ice last year, the 2017 season is now on sale with a larger rink and a number of themed nights planned. More than 60,000 people got their skates on last year when the Admiral Ice Rink went undercover for the first time, which resulted in no sessions being lost to poor weather, and an even more magical experience under the sparkling, starlit roof. This year Cardiff becomes the first outdoor rink in the UK to receive Access Accreditation, allowing even more wheelchair users onto the ice. The rink opens on November 9 and over the following eight and a half weeks more than a quarter of a million people are anticipated on site, attracted by the Giant Wheel and other fairground rides, plus all the food and drink on offer in the authentic Alpine Village and the cosy, atmospheric Bier Keller. This year the ice rink operator, 11th Hour has extended the special wheelchair accessible sessions, introduced last year in response to demand from wheelchair users for a more thrilling experience on the ice. Music will be played at low level, lighting will be static, and the capacity of the rink will be reduced to allow those who may need additional support to enjoy the facility. There is also a disabled viewing platform and enhanced signage. Tickets: Cardiffswinterwonderland.com and TicketSource on 0333 666 3366. Contact us on tickets@cardiff-winter-wonderland.com for ticketing / school booking enquiries.